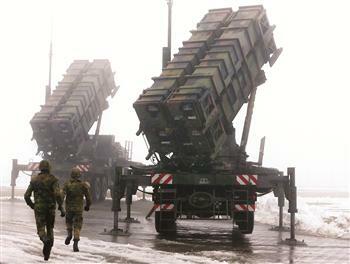 Patriot missile systems will be deployed in three Turkish cities of Kahramanmaraş, Gaziantep and Adana, NATO announced in a statement released today. The U.S. will deploy its Patriot batteries in Gaziantep, while Germany and the Netherlands will deploy the air defense systems in Kahramanmaras and Adana respectively. The deployment will take place over the next few weeks. http://www.youtube.com/watch?v=vhu67FwW87M --- Turkey invades Syria. http://www.youtube.com/watch?v=1gnDImvwCu0 --- Iraq invades Syria. http://www.youtube.com/watch?v=YJuPjE_FePM --- FSA supply lines into Syria. http://www.youtube.com/watch?v=Zzx9joTUzfM&NR=1&feature=endscreen --- 'The New Ottomans' as reported by Al Jazeera. could someone explain me why don't the US send the 'THAAD' batteries to TURKEY that seem to be more advanced than these PATRIOTS!.INSTEAD OF SENDING THESE HIGH TECH AIR DEFENSE SYSTEMS TO A NATO MEMBER a cunning US IS INSTEAD GIVING THEM TO A PETRO-DOLLAR RICH U.A.E!!! !.